2 What are the roast? 3 How to fry the coffee house? 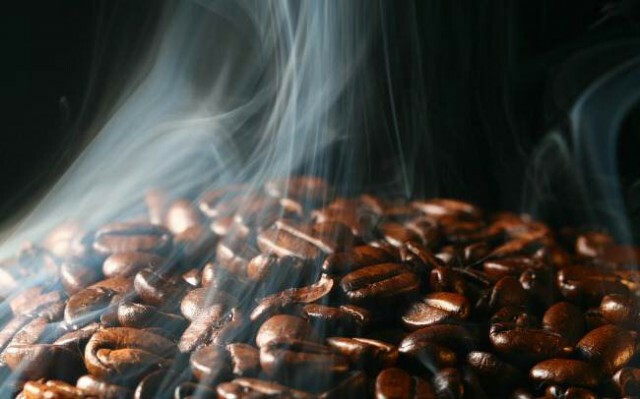 known, that organic coffee is prepared from ground and first roasted coffee beans. For frying use raw coffee, so-called green coffee. Proper roasting coffee beans, raw - is the foundation of quality beverage. It is believed, that roasting coffee should be dealt with only by professionals. After all depends on their ability and the wonderful smell, and typical of the class color, and ultimately the taste of your favorite coffee. Roasting can be done traditional and industrial methods. The traditional way - the most ancient. Today, it is used in small coffee shops, which have their own recipes and secrets, often transmitted by generations, as well as for frying at home. For him, use pans, obnoxious, grid, in which the grain is placed, and heat them to a specified color. In mass production, this method is considered to be unacceptable, due to the complete lack of control over the degree of roasting. Industrial process for roasting most massive. By using special equipment or drum with hot air. In the first method grain roaster placed in drums, are heated to a certain temperature, rotating at the same. Small enterprises for frying watch roasters, controlling the process using the instrument or visually. Grains must acquire color, characteristic grade of the sample, It is evenly browned. Usually roasting process takes 6 to 15 minutes. Then follows the rapid cooling grain, so that it too does not overcook. Sometimes the drums in large enterprises can hold dozens or hundreds of kilograms of raw materials, and the production is the next electronics. Roasting elite varieties produced by hot air. The grain is rapidly heated by hot air of about 200aboutWITH, and higher, then it comes under the control electronics to the desired condition. This is a more gentle, uniform and short way to roast. There are other, less common modern methods of roasting, using microwave and infrared heating. Expensive coffees, usually, fried weaker, a stronger roast flavor to hide flaws of low grades. 1. Light Cinnamon - the mild roasting beans, usually used for morning coffee, It has a very mild flavor is great in combination with milk and cream. 2. American Roast (American roast) - moderate degree of roasting. Grains are fried until light-brown, but not allowed the selection of coffee oils on their surface, coffee flavored with bitterness. 3. City Roast - light brown grains, delicate aroma and taste. 4. Full City Roast - a stronger degree of roasting, color brown beans. 5. Viennese Roast - frying medium strong, grain slightly oily, are the color of chocolate, sweet flavor, refined taste. 6. French Roast (French roast) - grains have a color of dark chocolate, pronounced bitterness. 7. 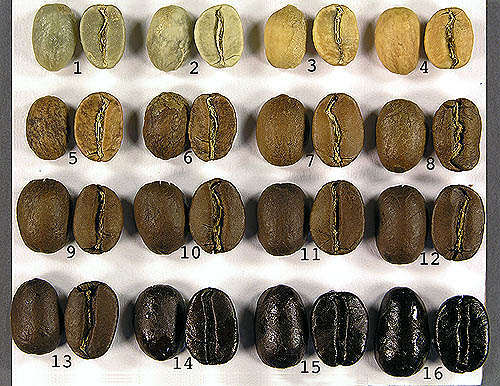 Italian Roast (Italian roasting) - high temperature grains become black-brown, shiny and dry surface. taste expressive, bitter. How to fry the coffee house? Some coffee lovers prefer to fry it yourself at home. This usually pans used, obnoxious, or special devices, so called home roasters, where the process is automated. The roster has certain modes of roasting, including cooling mode, which allows without too much trouble to fry 250 g grain at a time. But the roast in the pan is more complicated, the process requires some skill, Experience and patience. It is advisable not pan with the thin bottom, take the edge higher, better with a transparent cover. When the lid is closed the roasting process is faster, The aroma is intense. Aspirate, will be a lot of smoke. Fry over medium heat needed, shaking and tossing periodically grain pan on their mixing, holding the cover. The transparent cover can help to control the degree of roasting desired color. Do not take a lot of grains, before roasting them recommend to wash and dry on a napkin. Preheated pan, pour grain layer is not more 2 cm, fry them, tossing in the pan, before the first cod (kreka), this is the so-called City roast («city»). If you continue to fry, the grain will be more dark, until browned to a second, weaker crackles (roast «full city»). Gradually, you can complete all degree, and highlighted the need, according to taste. Under roasted grain cover approximately 10-15 minutes, without cover for much longer, to an hour, depending on the variety. After roasting grain immediately pour into cold dishes, stirred vigorously, so they cool quickly, do not overcook from its heat. We leave them hours 12, for the so-called degassing of carbon dioxide, covering dish, but leaving air access. If you grind them and make coffee immediately, the drink is sour. note, that the color of the roasted beans may be somewhat different, this happens due to the fact, that the sale is usually supplied mixture varieties.